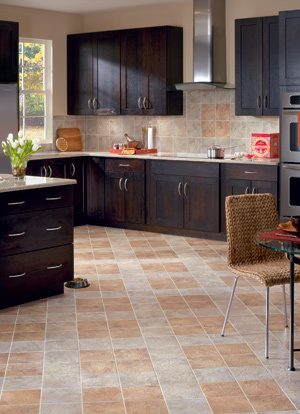 Proper maintenance is the key to a trouble-free ceramic tile floor. Damp mop weekly. Wipe down your ceramic floor with a damp mop at least once a week (or more often for heavy traffic areas). Mix 1 cup of white vinegar to 2 gallons of clean tap water for a great cleaning solution. Never use a detergent or soap because it can dull the surface or promote the growth of mildew. Note: Do not use this solution on natural stone. Also, wait at least 72 hours after installation before damp mopping to allow new ceramic tile and grout to dry. Use protective mats. Good quality entry mats will help protect your ceramic tile from premature wear. They trap the dirt, sand, grit, and other substances such as oil, asphalt, or driveway sealer that would otherwise be tracked onto your floor. Add protective pads to furniture. Protect your tile by affixing felt or similar pads to the legs of any metal, iron, wood, or plastic furniture that will be placed on it. Exterior metal furniture, which rests on tile floors or patios, may rust and cause staining. An additional grout shield can be used to help protect your grout color and defend against spills, traffic and dirt.